With our Hosted Call Centre solution you have the option to have agents working from multiple sites or from home, all working from one database and one phone system, with low cost, crystal-clear calls. 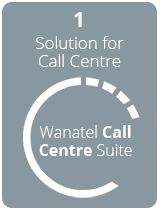 Wanatel Hosted Call Centre solution gives you all the features of a dedicated call centre service at a fraction of the cost of creating and managing your own. It’s flexible, powerful and very cost-effective. Our Hosted Call Centre provides the same features and functionality as proprietary call centre platforms at a much more competitive price. Your business needs flexibility. Our hosted call centre solutions were developed with that in mind. They are scalable, enabling you to rapidly and cost-effectively add new users to your system and increase their productivity by providing easy access to all features and capabilities. With our Hosted Call Centre solution you have the option to have agents working from multiple sites or from home, all working from one database and one phone system, with low cost, crystal-clear calls. Wanatel Hosted Call Centre solution can fully benefit your business. Whatever your requirements may be, Wanatel is ready to help. Our engineers will work with you to design a system that meets your unique business requirements and you will never have to worry about upgrades and maintenance with our Hosted Call Center solution. Why you get more advantage with a Hosted Call Centre solution ? Quick to install: Compared to traditional Call Centre systems a Hosted Call Centre solution is quick to set up. Minimal capital upfront: Wanatel will provide the infrastructure. There is no large investment required, beyond the physical costs of your call centre set-up and employing your call centre agents. Save money: Because it’s a Hosted Call Centre solution you don’t have to bear the costs of running and managing your own call centre software. You’ll save money on call centre service set-up, maintenance, technical expenses, and hardware and software costs. 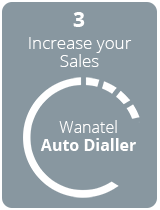 No additional call centre maintenance costs: Wanatel will maintain the call centre software for you. We will assure that it is always running and upgraded. 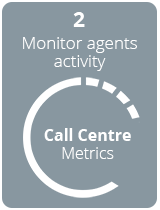 Flexibility: With our Hosted Call Centre solution you can scale your call centre management software according to the functionality you require and the call volumes you need to handle. If your business grows, your Hosted Call Centre grows with you. High levels of reliability and security: It’s hosted in our Data Centre, our fully redundant and resilient network, VoIP has never been as efficient and easy as it is with Wanatel Hosted PBX. Support by Wanatel: Your Hosted Call Centre will be fully supported and maintained by a dedicated support team so you can carry on with your business. You don’t need to hire technician to maintain your Call Centre. Who would use a Hosted Call Centre solution? A Hosted Call Centre solution is particularly suitable for companies that need a cost-effective call centre to deal with specific marketing campaigns or business contingencies. A new company that needs to handle daily customer queries but cannot afford to invest in its own call centre service infrastructure. An established company that wants to add a call centre to its customer service but does not want to incur the costs of creating and maintaining its own call centre infrastructure. A company that requires a Disaster recovery site.